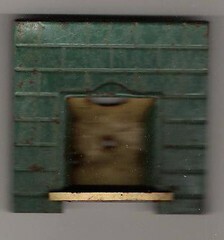 Tin fire place from a dolls house. 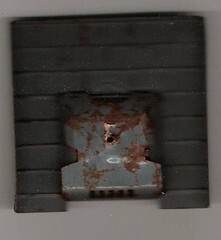 Slightly blurry scan of the front. It looks a bit like our fireplace in the front room. 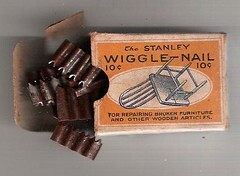 Small tin firelace for a dolls house. 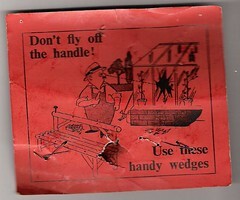 N.B It even has slots for the ashes to fall through. 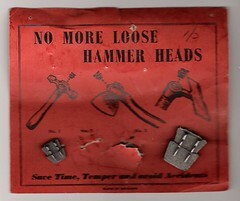 NO MORE LOOSE HAMMER HEADS. 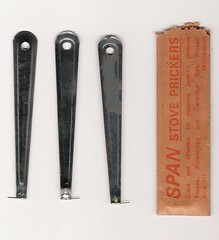 Whilst sorting out the coal hole I rediscovered these Stove Prickers. N.B Mice nibbles on packet. Todays find on the boot fair at Witton Albion Football Club. A bottle opener in its own leather case. 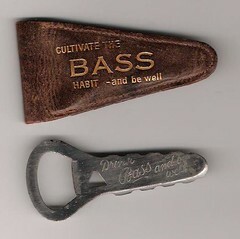 "Drink Bass and be well"
and embosed in gold on the leather holder. "Cultivate the BASS HABIT - and be well"
Micheal and I just both asked each other if Bass Beer was still made..
Only 10 cents a box. And the best name for a piece of corrugated metal I have heard. 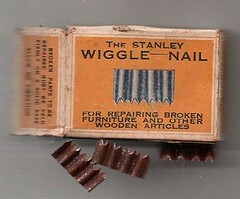 FOR REPAIRING BROKEN FURNITURE AND OTHER WOODEN ARTICLES. Thank you Angelica for these and all the rest...still looking for a swap for you.